In Manchester on Friday Marion and I visited the refurbished Whitworth Art Gallery. The handsome building has been enlarged, and its redesigned interior looks very stylish indeed. ‘Stylish’ also describes some of the art inside, but in a not-so-positive way – in the sense of ‘more style than substance’. One piece struck me as the absolute epitome of Bad Art. It is called ‘War Room’ and it is part of a retrospective exhibition by the award-winning conceptual sculptor Cornelia Parker. 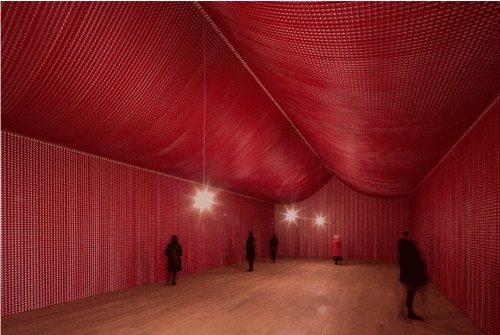 You enter a large room and find that it is a sort of tent. 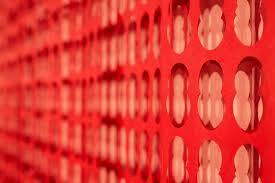 The walls and roof are big red sheets which have smallish holes cut out of them. The point apparently is that these sheets are what is left after the Remembrance Day poppies have been stamped out at the factory. The regular stencilled pattern of the cut-out, absent poppies covers the paper. It is a room full of punched-out holes, regular and regimented as a march, or the grid of graves in a Flanders war cemetery. The overall effect is oddly festive, which makes it more disturbing. I didn’t feel that. It just seemed silly. This is a work that seems to offer to confront a big theme – war – but in fact has nothing to say about it. It’s nothing but an empty gesture, and that’s my definition of Bad Art. I didn’t get to see the moat full of poppies at the Tower of London, but I’ve spoken to people who were genuinely moved by them. From pictures one can see that it was a sight of some magnificence, and that each poppy was a thing of some beauty. Because the number of the poppies increased until it reached 888,246, the number of British military personnel who who died, it embodied a large truth about the War, and revitalised the rather over-used symbolism of the poppy. Other Parker pieces have the same quality of null pretentiousness, and also exemplify how not to make art out of war. There is, for example, a spiral of silver wire. Does it mean anything? The label tells us that this wire has been drawn from the melted-down silver of a medal. A square of wire is even less interesting to look at. That has been made from the lead of a bullet. So once again, she’s touching on the theme of war, but has nothing to say about it. If she had taken the metal from a shell-case and made something useful of it, some domestic object like a set of spoons, that might have said something, in a slightly banal swords-to-ploughshares sort of way, but these art objects say nothing. Crucially, they are visually null until one reads the label. The Modernists accused some Victorian art of being literary, when understanding the picture very much depended on knowing the myth or story behind the title. This is much more literary than that, since the artwork does is of no interest whatever without the information on the label. As I say, the design of the whole gallery is stylish, but is stylishness enough? In the gallery’s shop, along with expensive knitwear, there were books on ‘mindfulness’, the yuppie religion-substitute – vague uplift at no mental cost. Yes, I though, that fits in only too well with some of the art on display here. As a contrast, in the morning we had popped into the City Art Gallery, and had seen their display of panels from Stanley Spencer’s stunning Sandham Memorial Chapel. These are great war art because they do so much more than take a general theme and do something tricksy with it. They are the product of Spencer’s deep consideration of the subject, and his feeling for the actual men involved, and his engagement with the history of painting. There are scenes of war, and the astonishing Resurrection altarpiece, here’s just one minor panel, one of the vignettes showing activities in a hospital. It’s called ‘Bedmaking’. 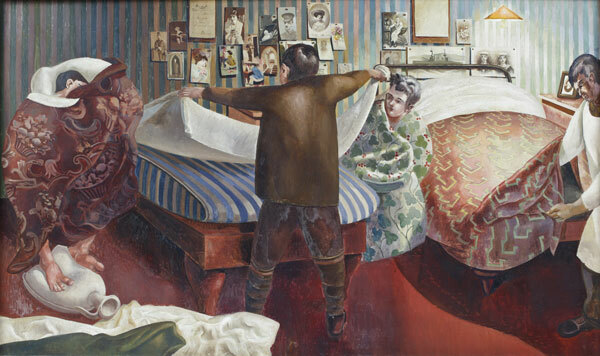 We see convalescent men engaged in the routine but useful task of making their beds, and there’s one invalid alert enough to be taking a lively interest in what is happening. The photographs above the beds remind us that these are men with families, histories, identities. But on the left there is the disturbing shape that takes a little decoding at first, until one realises that it is a seated man who has wrapped himself completely in his quilt. What dreams and fears are cocooned in there with him? Will he one day be able to come out? Maybe Spencer intended these four figures as the stages of a rehabilitation; or maybe he is suggesting that even the confident man in uniform will have times when he is as distraught as the man on the left. Either way, the artist is showing his interest in the actual men – victims of war but more than just victims, human beings like us. I saw Spencer’s paintings in the morning. So you can see why after lunch I was not in the mood to be impressed by a tent full of holes. This entry was written by George Simmers and posted on March 3, 2015 at 11:24 am and filed under War Artists with tags Bad Art, Remembrance Day poppies, Stanley Spencer, Whitworth Art Gallery. Bookmark the permalink. Follow any comments here with the RSS feed for this post. Post a comment or leave a trackback: Trackback URL. I am in agreement about bad modern art that has no meaning without reading the label. So often the artwork’s meaning exists only as a pun or a symbol. It does not compare well with Stanley Spencer. I was brought up in a house quite full of “useful” objects made out of shell casings and other artillery detritus. Ashtrays, mostly, or ornaments for the fireplace, to hold pokers and other tools. Some were just polished brass “obects” with holes drilled in them. My mother would spend a couple of hours every so often with the Brasso and sheets of newspaper over the carpet. I suspect the only statement they made about the war was that soldiers spend most of their time with nothing much to do and have to find something to combat boredom. Cornelia Parker says her grandfather spent the time knitting. Some conceptual art is just a space into which you pour your own meaning, or not. Ideally, it works as an object as well as perhaps being amplified by a label or a backstory. I thought “Cold Dark Matter” did, when I saw it originally. “Mindfulness” done properly is a genuine religious practice, in several cultures. It probably doesn’t work so well rehashed as a self-help exercise or a “coaching tool” or one of the other branches of business speak. I couldn’t agree more about the quality of both works. If he is, it’s remarkable. If he isn’t, I apologize.